Aaah yes…fall weather has finally arrived here in my hometown. Gone are the 95+ degree temperatures accompanied by 70% humidity. I am not going to miss hot weather. Even though I am a lifelong resident here on the gulf coast, I have always been able to tolerate cooler weather than hot weather. Notice I didn’t way cold weather. We don’t really have cold weather as most people have. On the gulf, if it dips below 40 degrees, we think that is almost winter weather storm warning time. I have a neighbor whose son left for Iraq this past summer. In fact, I made a blog entry about it. She received word yesterday her son had been slightly wounded by shrapnel from a RPG round fired from Islamic insurgents. He was treated at the local military hospital and released by to his squad. He reported to her the insurgency has died considerably from all reports of the soldiers there for a year or longer. But, it is sheer nonsense to think the violence has dissipated completely. I am glad he’s alright. His mom related to me he has lost 15 pounds off his skinny frame. Those MRE’s are supposed to put fat on you. I was surprised to hear that. I have not received any more threats for my two political posts, of last week, since I reported the threats to both Google and local law enforcement. I did not feel I was ever in any real danger. It seems that some people can’t tell reality from cyberspace. For some people, this medium is their reality. So, in that sense, it’s not surprising that some people took offense to my criticism of Senator Obama. I intruded upon their world with something they didn’t like. I am an equal opportunity political blaster. I go after both the Republican and Democratic parties with equal gusto. The same goes for both John McCain and Barrack Obama. I just dislike Obama a little more than I do McCain…but not by much. 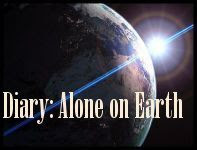 Finally, I am enjoying my new blog, “Diary: Alone on Earth.” It is a release of a desire I have always had. That desire? Writing! I enjoy it very much. I wanted to be a writer when I was kid. I had planned for that from the time I was in the 7th grade. But, Vietnam called and off I went to war. Like so many things that sidetrack you in life, I never got back to pursuing that goal. I don’t have much traffic yet. Seriously, I am averaging about 4 or 5 visits a day. But, that is about what I averaged with this blog until one day it just took off. I learned something with this blog; don’t give up. I felt in the early days, of this blog, I was in an empty room just talking to myself. But, I kept at it and I have some serious traffic now, and a decent feed count after just 6 ½ months. Not giving up is the single most important thing I learned about creating a blog. I suppose that holds true for any worthwhile endeavor. Just keep plugging on and good things usually happen to those who persevere.